I managed to finally do my Easter nails! I'm still new to freehanding nail art, but I thought I would give some simple stripes a try. I have seen so many cute Easter nails, so I just didn't know what to do for my own! Pastels were clearly on mind, so I went with that. 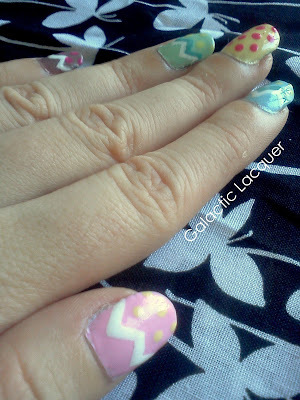 And after seeing Michelle Phan's Easter nail tutorial, I knew what I was going to do. I went with designs pretty close to the ones seen in her video. I did, however, make each nail a different color, but switched up the designs a bit. I first applied a base coat, then a different color on each nail. It took a few coats for each since the pastel Revlons are a bit thin to me. Then I took my accent colors and applied them with a dotting tool, and did the stripes with a very fine brush. I then topped it with Seche Vite. 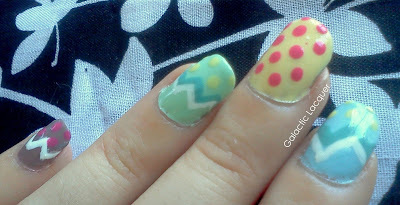 I ♥ your Easter nails!! Way cute! I am not good at nail art! Aww, thank you! I know I'm not very good at it yet compared to other people. It takes a while to get the hang of! 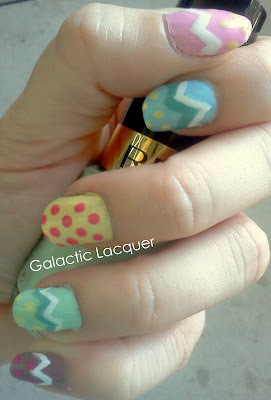 You could always get some dotting tools to begin :) simple designs, but really cute and fun! Cute Cute!!! 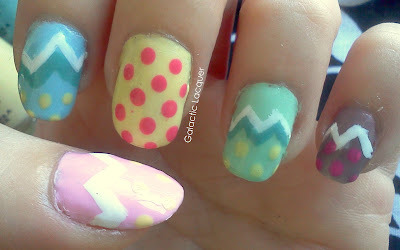 Love the easter nails. Thanks :D One of my first freehanding attempts with the lines!